Banana Oatmeal Cookies are made simply with oats, banana, raisins and applesauce. This cookie is healthier than just about anything out there. Gluten Free. Vegan. Dairy Free. Say the word cookie, and the inner cookie monster seems to come out in all of us! At the mention of cookies in my house, my children’s eyes light up and I quite literally see drool coming from their anxious lips. 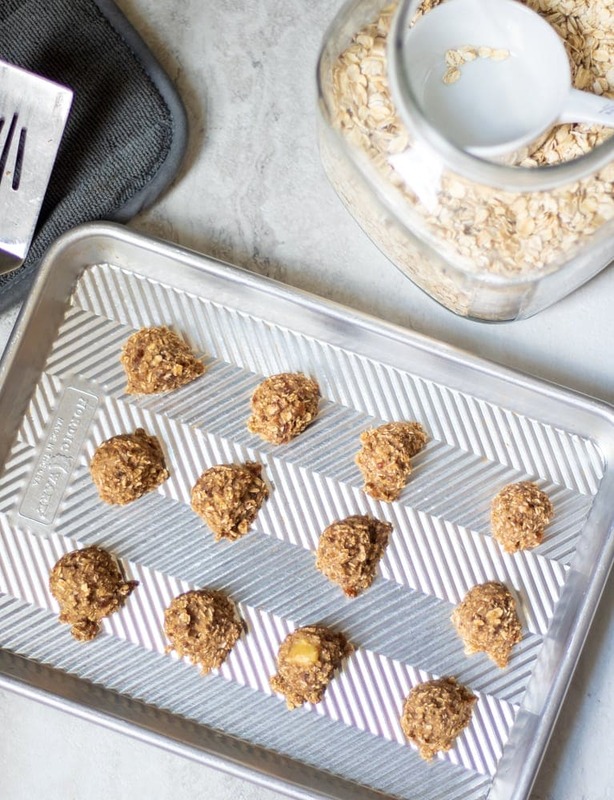 Wouldn’t it be nice if we could eat warm cookies out of the oven morning, noon, and night?I am right there with you–and that is why I know you will loves these Oatmeal Banana Cookies that are healthy enough for breakfast. These banana oatmeal cookies contain no oil, no sugar, whole grains, fruit. They are gluten-free, vegan, nut free, and corn free. My children think Banana Oatmeal Cookies are delicious. And I love that I can serve these Banana Cookies for breakfast or a snack and watch my kids smile. 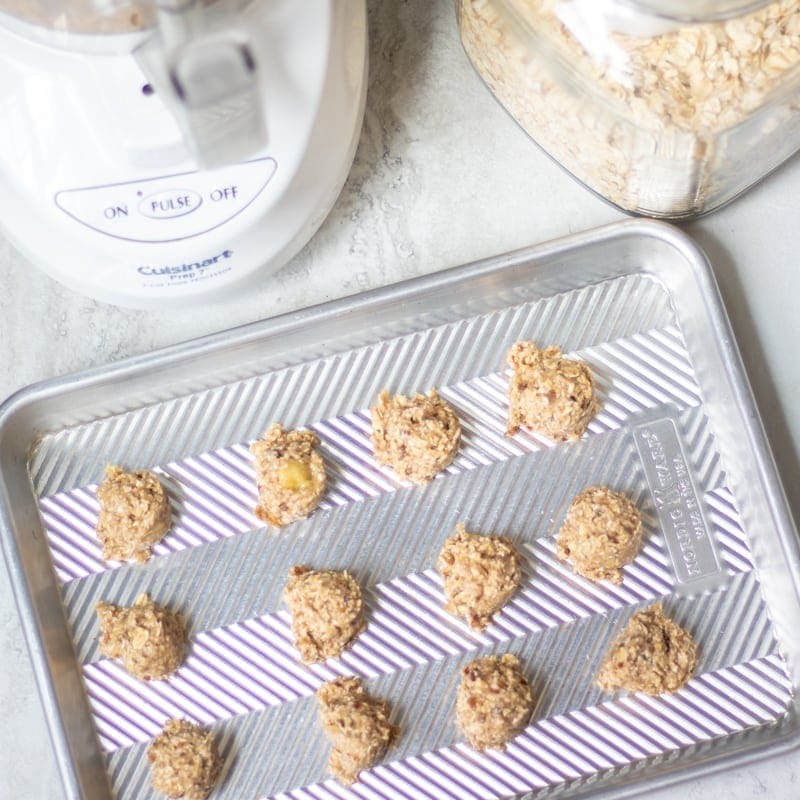 These Banana Oatmeal Cookies are incredibly easy to make, in fact they are one of the first recipes my kids made all on their own. Dates can be a bit hard, but if you soak in hot water they soften up perfectly and are much easier to blend into the cookie batter. Place one cup dates in bowl. Pour 1 cup boiling water over dates. Let soak for 10 minutes. Drain dates, reserving soaking liquid. Use soaking liquid to add sweetness to smoothies, oatmeal, or pancakes. In a food processor, place dates, bananas, applesauce and cinnamon. Puree until a smooth batter forms. Open up your food processor, and add in the oats. Close food processor, and pulse 3-5 times until oats are incorporated into batter. If you would like, now is a great time to add in mini chocolate chips as well for Banana Oatmeal Chocolate Chip Cookies. Use either a small cookie scoop or tablespoon measuring spoon, scoop out cookie dough onto baking sheet. Use your hands to roll into small balls or slightly flatten, if you prefer a flatter cookie. Bake the oatmeal banana cookies until just set. Of course, because these cookies are egg free, you could even eat the batter raw! Where Can you Find Dried Dates? Whole dried dates have been referred to by my children as God’s Candy. They are sweet and incredible to use in larabars,gluten free granola bars, or these oatmeal banana cookies for natural sweetness. You can purchase dried dates online, or at your local grocery store near the dried fruit. Sometimes, grocery stores will have dried dates in the produce section of the store as well. ***Be sure to purchase WHOLE DATES, chopped dates have been coated in cornstarch and sugar. If you do not have a food processor, chop up the soaked dates, and then mash together with bananas, applesauce, cinnamon and oats. You will have a chunkier, but still delicious Banana Breakfast Cookie. You can use quick cook oats or old fashioned oatmeal for this recipe. Be sure to use certified gluten-free oats to make these Gluten Free Banana Oatmeal Cookies. I have used both raisins and dates with great success in these Vegan Banana Oatmeal Cookies. If you are using dates, be sure they have not been coated with sugar. Dates are plenty sweet on their own. Reserve the date soaking liquid to add to oatmeal recipes or smoothies for naturals sweetness. Banana Oatmeal Cookies are made simply with oats, banana, raisins and applesauce. No sweeteners, no eggs, no gluten. Soak dates in 1 cup hot water for 10 minutes to soften. Drain dates from soaking liquid. In a food processor, mix together bananas, apple sauce, dates, and cinnamon until well combined. Add in oats and process until just combined. Drop by rounded tablespoons unto a cookie sheet and bake at 350 for 15 minutes. If you do not have a food processor, chop up the soaked dates, and then mash together with bananas, applesauce, cinnamon and oats. You will have a chunkier, but still delicious Banana Breakfast Cookie. Add mini dark chocolate chips to make these extra special. If you can't find whole dates, raisins will work as well (and the raisins do not need soaked. They are fun to make with kids for sure, Nicole! I need these healthy cookies in my life! These look terrific!!! Thanks Liz–they are so tasty! Love the simplicity of this recipe. Perfect for kids! Thanks Nicole. Sometimes simple is best! This is great simple and healthy cookies! Cookie monster will surely love this! My kids would really enjoy these cookies, loaded with stuff they love! My kids adore these and I hope your children will love them too!